Originally from Newfoundland, Andrew attended medical school at Memorial University in Newfoundland and went on to specialty training in Emergency Medicine, Echocardiography, and Critical Care Medicine at McMaster University in Hamilton. Andrew completed the International Master in Donation of Organs, Tissues, and Cells for Transplantation at the Universitat de Bracelona in Spain and is the Chief Medical Officer for Donation at Trillium Gift of Life Network. He practices emergency medicine at St. Joseph’s Healthcare in Hamilton and is an Associate Clinical Professor of Emergency Medicine at McMaster University. 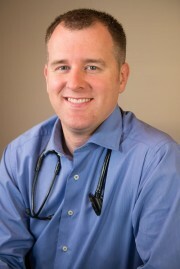 He is the Division Head and Medical Director for the Division of Critical Care Medicine at William Osler Health System.